bx_XL, Surround Sound/Spatialization Software from Brainworx. 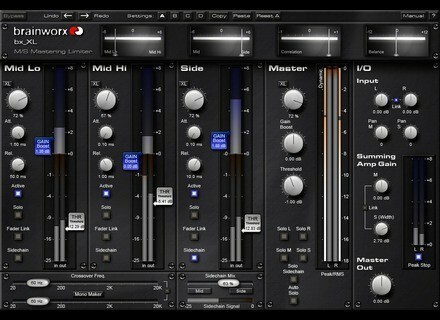 bx_XL is a low latency M/S mastering limiter whose main purpose is to help you get your mixes loud and clear. bx_XL separates any stereo signal into M & S signal and splits the M signal into 2 bands. bx_XL can separate the bass drum in any stereomix and master it independent from the rest of the stereo mix to get your mixes LOUD and still punchy, the company says. "While we developed the bx_XL processor I found myself wondering several times why it seems to be a “must have” in the audio-world today to “limit” your mixes to the extreme. While you can do so with bx_XL we truly believe that there is a certain stage at which you should STOP to squash your mixes more and more to eventually achieve “huge loudness” or volume. From a certain level on we at BX feel that too much loudness is a true limitation for your music. Limitation in dynamics, in power and strength... Certain music styles seem to require that squashed sound and “loud first impression”, but you might achieve a bigger and longer lasting impact with a powerful mix that is loud... not dead. Please do keep this in mind when cranking up your mixes. bx_XL internally converts stereo signals into M (mid / sum) and S (side / difference) signals and splits the M channel into 2 bands (hi & lo). This way you can limit and level 3 individual channels to increase loudness and improve clarity of stereo mixes drastically – with much less distortion artifacts and while keeping much more “punch” than any other limiter system. Via the Crossover Frequency slider the “MidLo” channel can be used to separate the bass drum and limit it different than the rest of your mid signal easily! This is great for all kinds of dance, rap, techno and rock music! After these 3 channels have been mixed back together to a regular L/R stereo signal internally the signal runs through an additional (fourth!) final standard brickwall peak stop limiter which offers an adjustable master out level. bx_XL also has a 3 band “psycho-acoustic” loudness maximizer built-in and offers 4 automatable settings with copy & paste functionality. All these features combined with 32 steps of Undo / Redo and various detailed Level meters make for a sophisticated dynamics & loudness control system second to none. We recommend bx_XL to be used as the final plugin on the stereo master buss for mixing and mastering purposes and it can work great on any stereo bus / stereo sub group as well. bx_XL is based upon the M/S technology taken from our “modern classic” M/S EQ bx_digital. We developed this hi-end analogue EQ 2006/2007 begin_of_the_skype_highlighting 2006/2007 end_of_the_skype_highlighting and we have offered a plug-in emulation of this EQ ever since. Engineers and magazines around the globe rave about bx_digital so we decided to develop a limiter that “teams up” perfectly with our EQ in mastering situations. 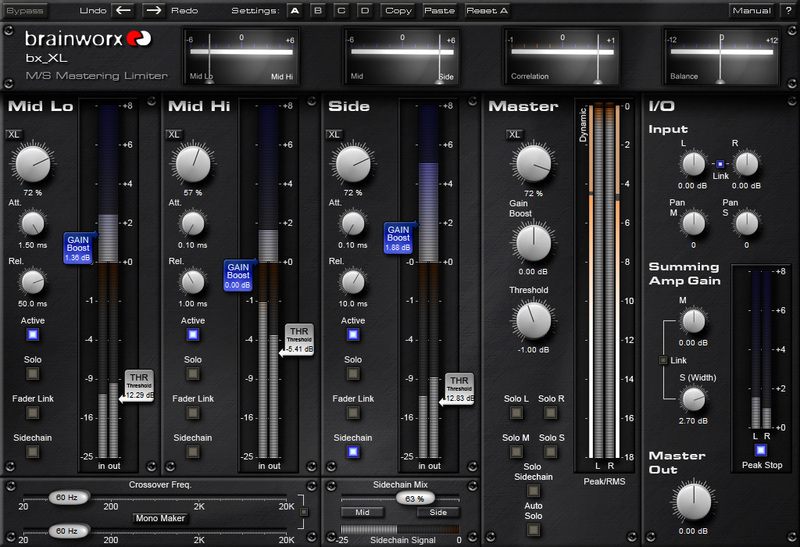 Multiple Solo, Auto Solo and Link features enable the engineer to precisely adjust all stages of this hi-end mastering limiter. bx_XL looks quite complex at first, but once you get the internal signal flow and audio splits you will be able to use it intuitive and fast." bx_XL will be available for sale October 20th - no pricing info yet. Akai SynthStation25 + App Akai Professional announced the SynthStation25 keyboard controller and the SynthStation music production app, both for iPhone and iPod Touch. Apex Web Media Pro Tools 8 Tutorial A Pro Tools 8 Tutorial Video geared toward beginners is now available from online training reseller Apex Web Media. Tek'it Audio Badass Tek'it Audio have released their new Badass filter and distortion plug-in, to "give to your sounds this little bad grain or destroy them completely with the help of distortion effects, filters, lowfi effect and ring modulator."